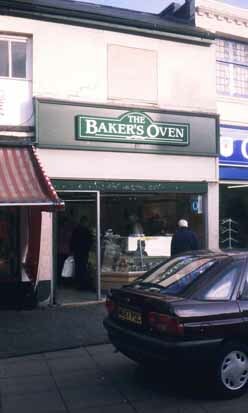 Bakers Oven was the largest bakery chain in the UK, before it was overtaken and then acquired by Greggs. Greggs is a fast food chain with more outlets in Britain than McDonald’s. Specialising in value and convenience, outlets sell sandwiches, but remain best known for “treat” food: sausage rolls, pasties, vanilla slices etc. Greggs’ dominance in the UK was established when it acquired Bakers Oven, its major rival bakery chain, in 1994. Bakers Oven was about 20 percent more expensive than Greggs, had more of a focus on in-store “baking” and typically offered substantial seating, which Greggs usually lacked. Bakers Oven was a concept developed in 1976 by one of the largest British bread makers, Allied Bakeries, itself a subsidiary of Associated British Foods, owners of Twinings, Silver Spoon sugar and Ryvita. Allied Bakeries also owned other bakery chain fascias, with names such as City Bakeries, Martins and Strathdee, and boasted of operating a store on almost every British high street. ABF owned many prime high street sites; a legacy of acquiring local bakeries. They had first attempted to create a nationwide bakery chain in 1968 with the Lite Bite shops. The claim that the first Bakers Oven was located in Barnard Castle, Durham is untrue. The location was previously operated by Carricks, a Newcastle upon Tyne bakery chain. and it was not rebranded to the Bakers Oven name until 1989. Bakers Oven rode the rise in demand for healthier bread in the late 1980s, although it never matched the quality of genuine bakers’ produce. It became the largest bakery chain in the UK, however by the early 1990s it began to consistently lose money, and around 100 stores were divested. Bakers Oven blamed the rise of supermarket bread sales for its struggles (ignoring the fact that Greggs continued to grow). The UK’s third largest bakery chain, Three Cooks, was also owned by a large British bread manufacturer, RHM (formerly Rank Hovis McDougall). The acquisition of Gladdings of Coventry took RHM to 300 outlets by the early 1990s. Greggs differentiated from its two major rivals in being publicly listed from the 1980s onward, whilst maintaining a large family-owned stake. By 1993 Bakers Oven operated over 500 shops and employed over 5,000 people. In 1994 Greggs acquired Bakers Oven, with 424 stores and two main bakeries, for £18.5 million in cash. This took Greggs to a total of 929 outlets. Greggs was interested in expanding into the South East, where the majority of Bakers Oven outlets were based. Greggs was strongest in the North, particularly the North East, where it had a 40 percent market share in some areas. Greggs was also interested in learing about in-store baking and seated catering from the chain. As a combined group, Greggs was able to lower central buying costs and increase profitability. Greggs also announced plans to lower the pricing of Bakers Oven, which it regarded as excessive. By 1995 Greggs had steered Bakers Oven into profitability by decreasing the focus on sliced white bread (in which they were undercut by supermarkets) and emphasising higher margin items such as sandwiches, savouries and pastries. 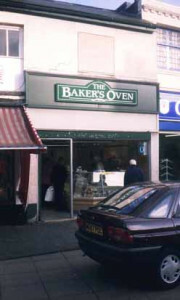 By 1996, 241 Bakers Oven outlets had been converted to the Greggs brand, mostly the units without in-store bakeries and seating and in less desirable locations. The Greggs model was to drive high volume value sales. However, new Bakers Oven outlets continued to be opened, and the chain was regarded as the company’s “premium brand”. In the late 1990s the chain was revamped, and items such as filter coffee and salad rolls were added to the menu. By 2004 there were only 220 Bakers Oven outlets remaining. By 2006 the brand had been withdrawn from Scotland and the North of England, with all former outlets converted to Greggs. In December 2008 it was announced that the remaining 163 Bakers Oven outlets would be rebranded as Greggs. Liked it? Take a second to support Thomas Farrell on Patreon! Support Thomas Farrell on Patreon!